What Day Of The Week Is September 3? 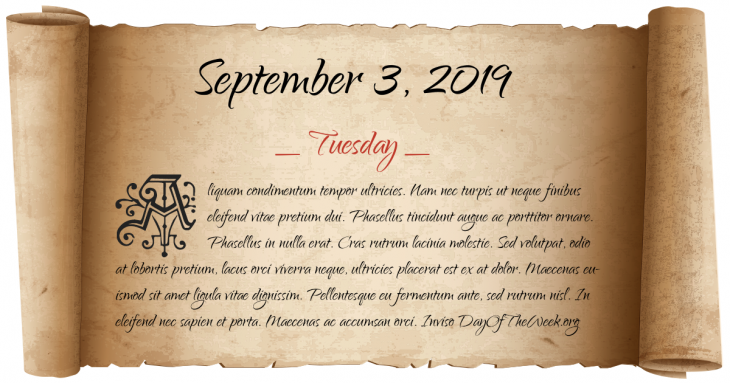 September 3, 2019 is the 246th day of the year 2019 in the Gregorian calendar. There are 119 days remaining until the end of the year. The day of the week is Tuesday. Richard I of England (a.k.a. Richard “the Lionheart”) is crowned at Westminster. American Revolutionary War: during the Battle of Cooch’s Bridge, the Flag of the United States is flown in battle for the first time. Three-day celebration was held in China, following the Victory over Japan Day on September 2. Viking program: The American Viking 2 spacecraft lands at Utopia Planitia on Mars. Who were born on September 3?